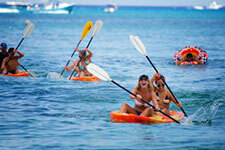 Whether you like to play in the water, on the water, or by the water, Cozumel has you covered. 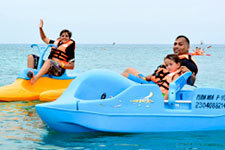 This island is a water sports paradise, and you can try out some of the top activities at our beach and water park. Put on your swimsuit and slap on the sunblock - it’s time to hit the water! Surrounded by some of the Caribbean’s most gorgeous ocean waters, Cozumel is one of the world’s top destinations for snorkeling, scuba diving, and water sports. Learn about all the fun activities you can try while you’re here, and plan an amazing beach vacation today. 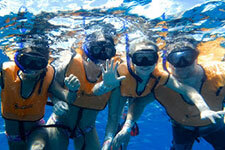 Scuba Diving - Cozumel’s renowned coral reef and colorful sea life attracts divers from all over the world. Your visit is the perfect opportunity to finally get certified to dive. Snorkeling - No certification is necessary for snorkeling, and you’ll find an incredible underwater Mayan city to explore right here at our beach park. Sailings - Take the reins and set sail! Our easy-riding sailboats have enough space for the whole family. Water Bicycles & Paddle Boats - Even young children can power these pedaled watercrafts, which make it easy to explore the crystal clear Caribbean waters. Kayaking - Glide across the top of the ocean on a two-person kayak. Our user-friendly kayaks are very user-friendly. Would you like to know more? 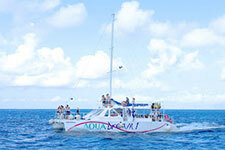 Discover 20 free attractions at Playa Mia, plus awesome add-ons like dive trips and catamaran tours. Contact us today to learn more about the biggest beach and water park in Cozumel!